during the Techtextil Media Tour. "We're excited to once again offer the North American textile industry a platform that blends together technical textiles, sewn products and the composites value chain, with the single goal to enhance the visitors' experience," said Dennis Smith, President of Messe Frankfurt Inc. To generate interest and increase the PR coverage of Techtextil North America and Texprocess Americas, Press Tours were conducted for the global media attending the show. The Press Tours were held on day one. Prearranged by show organizers, there were two separate tours, each with about a dozen or so international journalists and photographers. Exhibitors had the opportunity to present their new and innovative developments and technologies to the groups, who were escorted through the trade show floor to learn about the latest product developments, pre-submitted by exhibitors. The FabricLink Network looks at innovations in safety and protective products showcased in the Press Tours that also included an array of other categories including smart textiles, advancements in nonwovens, future uses of technology, reshoring, geosynthetics, as well as the newest techniques in production equipment. 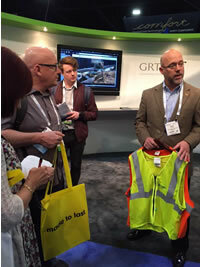 Glen Raven Technical Fabrics (GRTF) used Techtextil North America to launch two new products, the latest additions to GRTF's family of protective fabrics: 1) GlenGuard™ Hi-Vis 1500 modacrylic anti-stat mesh, an addition to its woven modacrylic Hi-Vis version, and 2) the aramid GlenGuard 5.3 oz. solution-dyed Arc-Rated FR. The company's ultralight 5.3 oz. 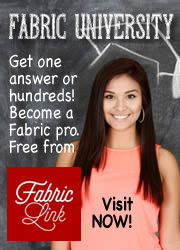 fabric is the lightest on the market with a CAT 2 protection rating. GRTF's WICKZZ technology allows moisture to quickly disperse across the GlenGuard fabric, which speeds up the evaporation process. These are comfortable fabrics that workers will want to wear more compliantly, and which provide crucial protection from flash fire or arc flash. GlenGuard fabrics minimize second and third degree burn risk and increase the chances of survival. 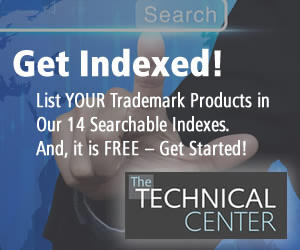 The fabrics have applications in oil & gas, electrical, chemical, and industrial markets. GlenGuard 5.3 oz. solution-dyed apparel and uniforms are available through Workrite®. 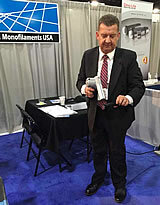 Wetekam Monofilaments demonstrated its new high-shrink monofilament tubing, which is formable under 200°C heat. The company produces different profile yarn shapes (round, oval, square, etc. ), in dimension ranges from 0.07 mm up to over 6.0 mm, and in almost every color and stabilization for a variety of safety and protective applications, including UV-protection, thermal stabilization, flame protection, and hydrolysis stabilization. Wetekam develops yarns and technologies, which offer a variety of highly developed monofilament products with specific properties that can be custom tailored to specific uses in such applications as: automobile, cable, technical weaving mills, medical, geotextiles, sport, carpets, and environment. Sandler AG develops and manufactures nonwoven roll goods for the hygiene and wipes industry, and technical applications for automotive, home textiles, filtration, construction, agriculture, including applications for flame-resistant products that meet specific demands in the event of fire. When subjected to blaze, sparks or open fire, these nonwovens do not catch fire immediately, and when ignited, the structures do not continue to burn, but have the ability to self-extinguish. Applications for these products include child car seats, filtration, construction, and upholstered furniture. Techtextil North America provided Sandler the opportunity to promote not only its wide range of nonwoven products, but also the opening of its newly established Georgia production plant, warehouse and base for national sales and distribution. "Establishing a new non-wovens manufacturing plant in the U.S. was an important decision from a strategic point of view and one of the most important steps in our company history," said Sandler CEO Dr. Christian Heinrich Sandler. Kobe-Cz s.r.o., a Czech Republic based company, used the Press Tour to showcase its line of nonwoven products that use a thermo bonding method to produce a line of nonwoven mats made from cotton, wool, kenaf, flax, wood, hemp, and paper or synthetic fibers (polypropylene, polyester, bicomponent fiber), and glass fiber for the building, automotive, and furniture industries. Kobe-Cz products have been used for the insulation of high temperature exposed elements in different industry sectors, as fire protection in the roofs and walls of homes, and as sound barriers and thermal insulation in construction. End-uses for Kobe's natural thermo bonding products include ship building, insulations, and eco buildings.